The human respiratory system is like a machine that works in a complex manner to keep us breathing. The air sacs are delicate, and the site of gaseous exchange, i.e., exchange of deoxygenated blood with oxygenated blood takes place here. Emphysema is a chronic lung condition in which the alveoli/ air sacs are damaged, collapsed, narrowed, stretched or overinflated. It is a part of a group of lung diseases called COPD or Chronic obstructive pulmonary disorder. Over a period, the inner walls of the air sacs weaken and rupture leading to the formation of large air spaces. This results in the reduced surface area of lungs. The stale air becomes trapped when one exhales leaving no space for fresh air to enter. As a result, irreversible damage is done to the air sacs. Only the patients suffering from this condition will be able to know the amount of discomfort that they go through! Complications are always a downside to any health condition. Likewise, there can be a few complications of emphysema too. Pneumothorax or collapsed lung is a condition which can be seriously life-threatening in people with emphysema. Emphysema puts an added pressure on the arteries that connect the heart and lungs. This can give rise to a condition called cor pulmonale which weakens a section of the heart. Due to emphysema, the lungs develop empty spaces called bullae. They reduce the space available for the lungs to expand as single bullae can be as large as half the lung. There can be many causes of emphysema-like tobacco and marijuana smoke, air pollution and chemical fumes and dust. The rising levels of air pollution in major cities of the world are also increasing the incidents of emphysema. In some of the cases, it can also be caused by the inherited deficiency of a protein called alpha-1-antitrypsin which protects the elastic structure of lungs. Smoking and exposure to second-hand smoke- Smokers, as well as passive smokers who inhale from someone else’s smoke, are also at a higher risk of developing emphysema. Age- the symptoms of most of the tobacco-related emphysema are seen between the ages of 40-60 years of age. Fumes of certain chemicals or dust from cotton, wood, grains and mining products can increase the risk of emphysema. Breathing pollutants like car exhaust can also cause emphysema. Since there is no way to repair or grow the damaged tissue, the primary goal of emphysema treatment is to prevent the symptoms and control the symptoms so that the disease does not get worse. Avoiding the smoke of others and staying away from air pollutants. Well, on the flip side there is a ray of hope for the patients with emphysema. Mother Nature does provide a solution for all the problems. Never be disheartened! You will be amazed to see the multi-benefits of curcumin that can produce promising results while treating emphysema. Curcumin is very well-known for its anti-inflammatory properties it significantly reduces the inflammation and relieves the constriction of the airway. Cigarette smoke contains free radicals which are the cause of oxidative damage. Curcumin and turmerone can prevent the loss due to oxidative stress. Over a period, the patients of COPD develop resistance to the prescribed steroids. Curcumin can reverse this resistance. At times, the damage to the tissues in case of emphysema can also turn to cancer. Since curcumin and turmerone both have anti-cancer properties, they prevent the progression of lung cancer. 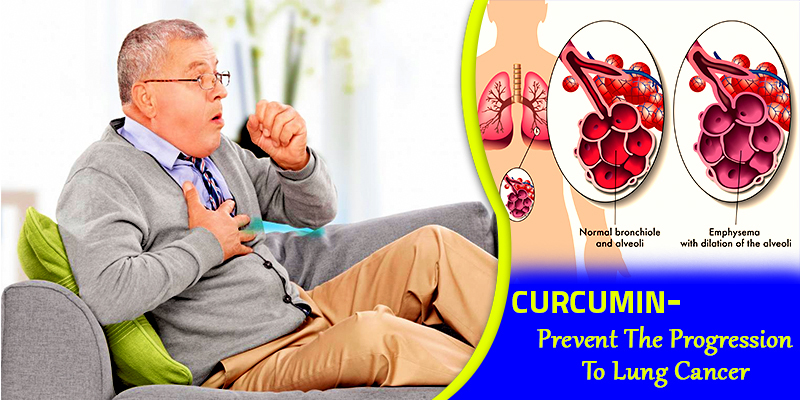 In case, there is a secondary respiratory infection like Streptococcus pneumonia, Haemophilus influenza, etc., curcumin can inhibit the growth of these bacteria. Buy Fukamin-A and give your Lungs fresh air to breathe! Fukamin A is quite an effective product to deal with emphysema as most of the treatments involved come with their own share of side effects. This article shares an adequate amount of information about this lung condition as well as the superior ability of curcumin to deal with it naturally.